CAMARILLO, Calif., Dec. 5, 2018 – Semtech Corporation (Nasdaq: SMTC), a leading supplier of high performance analog and mixed-signal semiconductors and advanced algorithms, announced that the National Narrowband Network Co (NNNCo), an Australian carrier, is deploying a publicly available network based on the LoRaWAN™ protocol that will leverage Semtech’s LoRa® devices and wireless radio frequency technology (LoRa Technology) to build Internet of Things (IoT) applications. The network is being rolled out with Goanna Ag, a major Australian agriculture company, with the goal of bringing smarter irrigation management solutions to Australian cotton growers. The network, an extension of NNNCo’s existing LoRaWAN-based network coverage, covers an area of about three million hectares, stretching across Murrumbidgee irrigation area and the Murrumbidgee, Lachlan, Gwydir MacIntyre, Namoi, and Macquarie valleys. NNNCo plans to expand the LoRaWAN-based network throughout 2019. The network will be used to bring low-cost Cloud-connected sensors and data analytics to growers, combining soil moisture data via installed probes, local weather data and satellite imagery to optimize irrigation scheduling. 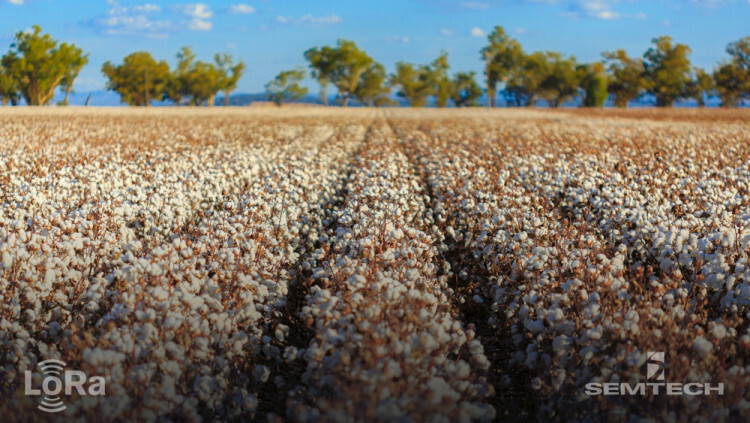 As this cotton season begins, NNNCo and Goanna Ag will deploy their first 100 gateways in New South Wales and Queensland, along with over 2,000 sensors across cotton farms. LoRa-based sensors will include soil moisture probes, rain gauges, weather stations, and water and fuel tank monitors among others. NNNCo is delivering a nationwide network and end-to-end platform to enable solutions for agriculture, cities, utilities, buildings and logistics. NNNCo is also providing the essential data layer platform (N2N-DL) behind the interface for farmers, simplifying the aggregation of data of any device into the visualization and analytics platform. All statements contained herein that are not statements of historical fact, including statements that use the words “will,” “goal of,” “to enable,” “designed to,” or other similar words or expressions, that describe Semtech Corporation’s or its management’s future plans, objectives or goals are “forward-looking statements” and are made pursuant to the Safe-Harbor provisions of the Private Securities Litigation Reform Act of 1995, as amended. Such forward-looking statements involve known and unknown risks, uncertainties and other factors that could cause the actual results of Semtech Corporation to be materially different from the historical results and/or from any future results or outcomes expressed or implied by such forward-looking statements. Such factors are further addressed in Semtech Corporation’s annual and quarterly reports, and in other documents or reports, filed with the Securities and Exchange Commission (www.sec.gov) including, without limitation, information under the captions “Management’s Discussion and Analysis of Financial Condition and Results of Operations” and “Risk Factors.” Semtech Corporation assumes no obligation to update any forward-looking statements in order to reflect events or circumstances that may arise after the date of this release, except as required by law.